The Geneva Motor Show always provides us with some spectacular green vehicles, but this year looks like being the best yet. Audi has now revealed its most production-ready electric vehicle yet, in the form of the Audi A3 e-tron. We've driven a prototype of the all-electric e-tron before, but the latest model introduces a plug-in hybrid drivetrain for the first time. Performance and efficiency have both been priorities with the A3 e-tron. The headline figure is 156.81 mpg, or just 1.5 liters of fuel per 100 km on the European cycle. The electric motor is suitable for speeds of up to 80 mph, while Audi claims a range in electric mode of 31 miles. A modified version of the Volkswagen Group's 1.4-liter TSI four-cylinder engine is paired with a 75 kilowatt electric motor. Together, the e-tron develops 204-horsepower and over 258 pounds-feet of torque, through a six-speed 'e-S tronic' transmission. With the combined torque of turbocharged engine and electric motor, this A3 will really pull. The electric motor's torque peak is sustained from zero to 2,000 rpm, with the gasoline engine developing its peak between 1,750 and 4,000 rpm. Performance is strong, with 62 mph a mere 7.6 seconds away and a top speed nearing 138 mph. Like many a plug-in hybrid, several driving modes are available--electric only, "boosting" hybrid, and the ability for both to deactivate for "gliding". 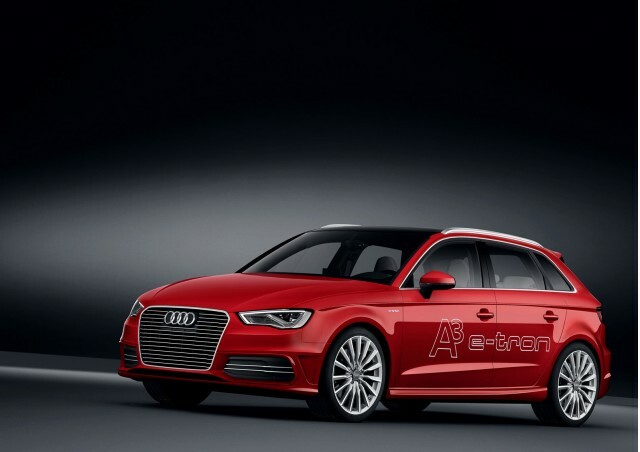 More details on the A3 e-tron will surface at the Geneva Motor Show on March 5. You can keep up with all the Geneva launches via our dedicated show page.